for $439,900 with 3 bedrooms and 4 full baths, 1 half bath. This 3,300 square foot townhouse was built in 2007. 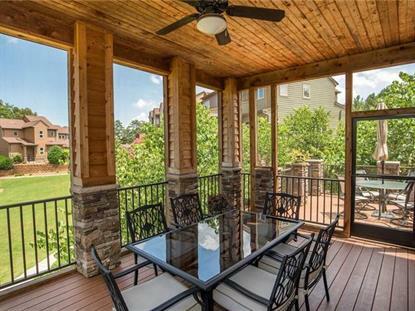 Stoneledge is a luxury Town Home Water Front Community. Beautiful view from this Hickory Model home with master bedroom facing the water. Two large bedrooms on the top level, master bedroom and living areas on main level and large "play room" in the lower level which leads to the water. Great Community with no maintenance living, lake swimming, pool, tennis court, walking trail, boat and RV storage, playground and much more. This unit does not have a dedicated dock slip lease, although Crooked Creek RV Park is right across the cove with slips for rent, boat ramp, gas and camping. Great construction with granite counter tops, crown mouldings, trey ceilings and most furniture included in the listing price. Upper deck and screened porch over lower level open porch AND you can add the 4 seasons room to the large screened in covered porch. You probably will never find a lake home of this quaiity at this price, a great value.